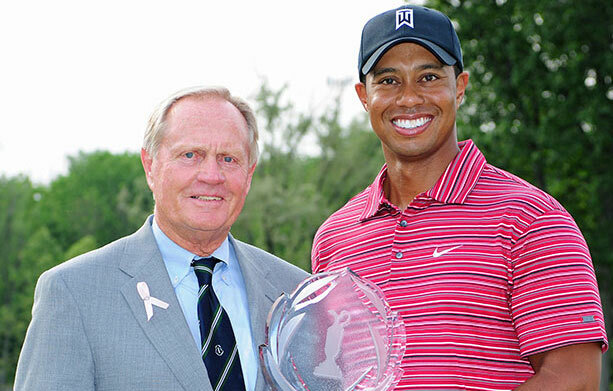 Jack Nicklaus with five-time Memorial Tournament winner Tiger Woods. Dublin, Ohio — The Memorial Tournament presented by Nationwide announced today that 14-time major championship winner Tiger Woods has officially committed to returning to world-renowned Muirfield Village Golf Club, where he will try to add to his record five Memorial titles. “From both the perspective of the tournament and as a golf fan, I am delighted that Tiger will be back at the Memorial. His record at Muirfield Village Golf Club speaks for itself, but he has not only been a tremendous and gracious winner, Tiger has been a favorite among the fans who always support the Memorial. We expect to once again have a wonderful field for this, the 40th playing of the Memorial, and we appreciate Tiger being among those players to give his early commitment and support to the tournament,” Nicklaus said. An 11-time PGA TOUR Player of the Year and two-time FedExCup champion, Woods took a voluntary leave of absence in February after withdrawing from the Farmers Insurance Open with back stiffness. Woods used the time to address struggles with his short game, vowing to only return when he could be competitive. He did just that earlier this month at the Masters Tournament where he was indeed competitive, tying for 17th. His return at Augusta marked his first four-round tournament of the year and just his third start. In additional Tournament news, race fees for the inaugural FORE! Miler presented by OhioHealth, a 4-mile road race that will kick off the 40th playing of the Memorial, remain available at $45 per person only through this Thursday, April 30. Beginning May 1, and until sold out, race fees will be $50 per person. All proceeds from the FORE! Miler benefit Nationwide Children’s Hospital. Race participants will receive an Official FORE! Miler-themed Technical Race Shirt, an Official FORE! Miler-themed Finisher’s Medal, one complimentary Practice Round ticket ($35 value) to the Memorial Tournament for Wednesday, June 3, which includes access to the Official Pro-Am and Memorial Honoree Ceremony, and a complimentary drink at the Post-Race Party. The FORE! Miler presented by OhioHealth begins at 6:30 p.m. on Thursday, May 28. The race will follow a route that starts and ends at Muirfield Village Golf Club and includes Memorial Drive, Avery Road, Brand Road, Muirfield Drive and Kinross Court. After the race, runners and walkers will enjoy a free Post-Race Party at the Golden Bear Club, an enclosed, climate-controlled venue located between the fairway at Hole No. 10 and the green at No. 14 at Muirfield Village Golf Club. The FORE! Miler is limited to the first 3,000 runners and walkers. The public can call the Tournament Ticket Office 9 a.m. to 5 p.m. weekdays at 877-MT BADGE (877-682-2343) or visit http://www.memorialbadges.com to purchase badges. Weekly Patron badges, which are valid Monday through Sunday and provide access to the Tournament grounds, are available for $173 each. Youths 16 and under can attend for free with a ticketed adult, and kids 18 and under are admitted free on Wednesday, June 3, 2015, for Junior Golf Day. Daily practice round tickets for Monday, Tuesday and Wednesday are also available. The cost is $35 and they are valid for all three practice-round days.